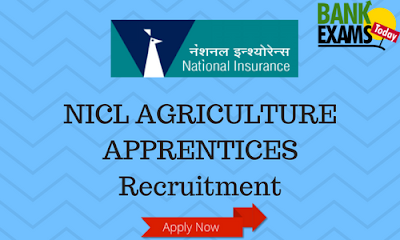 National Insurance Company Limited(NICL) has recently released a recruitment notification for AGRICULTURE APPRENTICES post. Last date for receiving application: 8th January, 2018. A two year period of Apprenticeship on full time basis offered to the eligible candidates as per eligibility criteria given below. This engagement is as Apprentice only for a term of maximum Two Years and selected candidates have no right to claim employment in the company. Company may terminate Apprenticeship even before Two Years, if candidate is not found suitable &/or performance &/or conductis not satisfactory. Graduate in Agriculture Science/Agriculture Engineering / Forestry / Horticulture / equivalent from a UGC recognized University with at least 60% marks in either of the degree or post-graduation examination for General and OBC candidates and at least 55% marks for SC/ST candidates. Invitation of Application through Advertisement in News Papers, Company’s Website www.nationalinsuranceindia.com and Government Portal www.ncs.gov.in. Screening and Short listing of Application by Committee. Selection by Personal Interview only. Note:- Company will display the list of shortlisted candidates on its website. Candidates are advised to visit the same at regular interval.